Yes, it swarms with summer tourists, but the setting of this Greek Isle is so picturesque and geologically striking that you should visit Santorini on your first trip to Greece. The two white-washed villages listed below take root on the island's high steep volcano rim. They are immensely photogenic. Their views of sheer cliffs and the deep-blue bay are breathtaking. It is the biggest, busiest and most touristed. Still, it has retained some of its alluring qualities. This village is in northern Santorini. It appeals to those seeking a more peaceful and laid-back ambiance for their vacation in Greece. Imeroviglia and Firostefani are also rim villages that attract tourists. 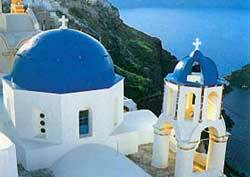 They are located between Fira and Oia. They are moderate-sized sea resort villages. They are less charming than the cliff-perching towns, but have wide beaches directly on the Aegean Sea.